York Valley Ranch is comprised of 1895.215 acres of open and gently rolling land. The ranch encompasses several lakes and ponds fed by York Creek and natural springs. The ranch is located less than one hour from Austin and San Antonio and within 15 minutes of IH 35, IH 10, San Marcos and its retail power centers, with a portion in Seguin ISD. York Valley Ranch is just minutes away from the world famous Circuit of the Americas F1 raceway and has approximately 14,000 feet of frontage on the fastest highway in the entire United States. York Valley Ranch lies between San Marcos and Seguin, approximately Equidistant from the IH35/SH 123 interchange in San Marcos and the IH 10/FM 2438 interchange east of Seguin, 10.5 miles from the San Marcos city limits, and about 11 miles from the Seguin city limits. The ranch is in the center of the rectangle formed FM 20, FM 1339, FM 3353, and FM 621. 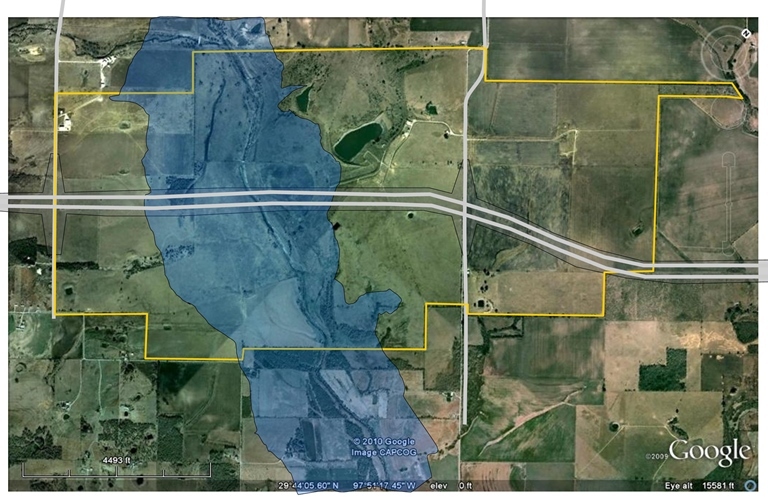 The ranch has frontage on both sides of Bylerpool Road, Wade Road, and York Creek/York Crossing Rd. The current segments of State Highway 130 constructed intersect the ranch from Northwest to Southeast and allow for approximately 14,000 feet of frontage on each side. © 2019 British American Development Corporation.